While just yesterday we saw a handset at the FCC which is supposedly the upcoming Nexus 5, now yet another device has been spotted at the Bluetooth SIG. 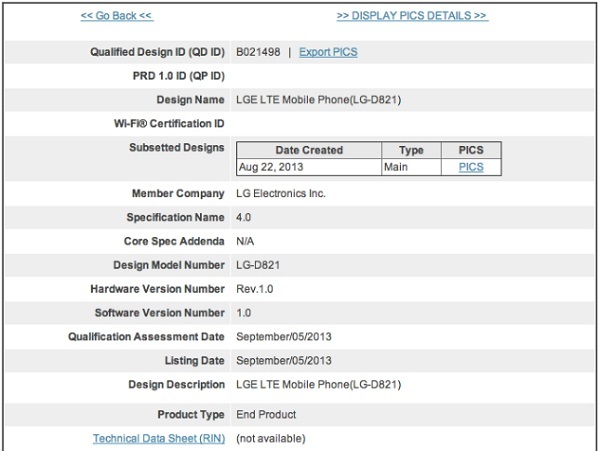 According to information available from Bluetooth SIG, an LG handset with the model number LG D821 has been documented. However the model spotted at the FCC had the model number LG D820, implying that this device could also be a variant of the device which is supposedly the Nexus 5. The documentation of the LG D821 at the Bluetooth SIG doesn’t reveal any specific details except the support for LTE and Bluetooth. The Nexus 5 is expected to feature a 4.96 inch display with the powerful Snapdragon 800 processor and the recently announced Android Kitkat v4.4. As of now Google hasn’t officially commented about the Nexus 5, but we should be getting a lot of new leaks about the device soon.